Mix 200 - 275 lbs. of mortar, stucco, grout, or concrete in less than 4 minutes with the IMER Minuteman II Mixer. Sale price good through 4/30. The Mighty Small 50 is the only 110v pump made that can really get the job done day in and day out on a wide variety of job sites. The IMER Mini Mix 60 is a light weight all purpose bucket mixer designed to take the place of a drill motor and a 5 gallon bucket. The IMER Mortarman Plus 120 is ideal for the 2-3 person construction crew so there is no need for all the hassles of towing a mixer to the job site. Imer Mortarman 360 series mixer produces 9 cu. ft. of mud every three to four minutes. Imer Workman 750 vertical shaft mortar mixer's output has been increased to 9-18 cu. ft. of mud every three to four minutes- perfect partners for busy precast mixing operations system. Imer Silent 300 Pump quickly and easily apply materials such as plasters, mortars, stucco (cement and synthetic based) fire proofing, sound proofing and paint. The Step-Up 120 is designed for the applications that need to be pumped and sprayed with more flow and pressure. The IMER Wheelman II 5 cu. ft. Portable Mulitmixer can hold 250 lbs of material per batch and is the largest capacity portable mixer on the market today. 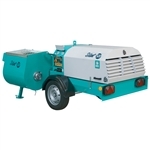 The Imer Workman II 250 Towable Multimixer (Electric or Gas) is ideal for any jobsite project. 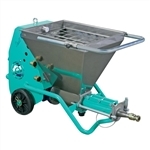 he Imer Workman II 350 Towable Multimixer is ideal for any jobsite project.